Ted Davis was happy to be able to stay in Memphis when he took over his newest leadership role as president and chief executive officer of medical device company Active Implants Corp.
Ted Davis recently became president and CEO of Memphis-based medical device firm Active Implants Corp. after holding leadership roles at Wright Medical Group and MicroPort Orthopedics. Davis worked for about a decade to grow Wright Medical Group Inc.’s business in Arlington. When Wright Medical sold its hip and knee replacement business to MicroPort Orthopedics in 2015 – a transition he helped orchestrate – Davis became chief executive officer of MicroPort. Wright, meanwhile, began to focus solely on its extremities business, primarily focused on implants for the ankles and feet. Active Implants’ NUsurface Meniscus Implant is the first of its kind. It helps restore load distribution in the knee and protects cartilage, with the goal of delaying a total knee implant. Once he had MicroPort fully integrated, he began looking for his next leadership role. On the entrepreneurial side, Davis has worked with the Memphis Bioworks Foundation and other efforts around town to create new companies. Davis was approached to join the board for Active Implants last year by medical device entrepreneur Henry Klyce. Active Implants was founded in 2004, and clinical trials began on the NUsurface Meniscus Implant in 2008. 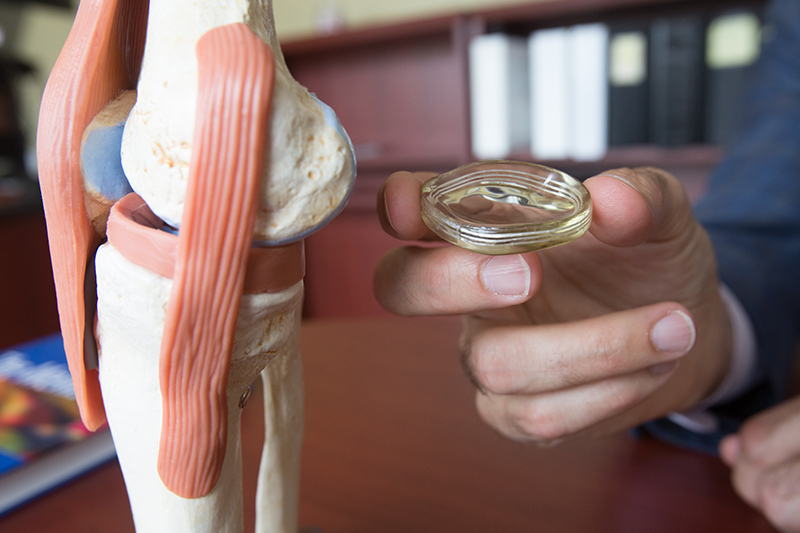 The company’s NUsurface device helps restore load distribution in the knee and protects cartilage from further damage, with the goal of delaying a total knee implant. The device has been in development for more than a decade, and there will now be limited commercialization in Europe and at some of the company’s clinical sites. Two clinical trials are ongoing, and the data gathered will be filed for FDA approval in the U.S.
Davis trained at Vanderbilt as a biomedical engineer, and describes himself as “the guy who was going to med school and ended up distracted in business school.” He spent a little time in the sales side of life sciences and the pharmaceutical industry, and did some health care consulting before going back to business school. “When I went back to business school, I was focused on working into the venture capital side of life sciences, so investing in small startup companies, not unlike Active Implants,” said Davis, who spent a decade in Chicago before moving to Memphis to join venture capital firm MB Ventures. 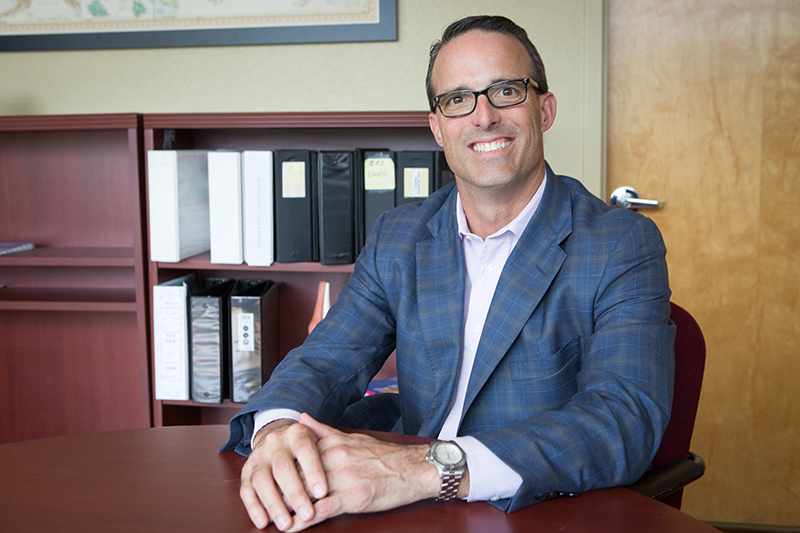 At Wright Medical, he led business development from 2006 to 2012. From 2012 to 2015, he was divisional president of Wright’s OrthoRecon business – the business sold to MicroPort – leading mergers, acquisitions and strategy. He oversaw the acquisition and integration of a series of extremities and biologics platforms during Wright’s transformation into a market leader in the extremities market segment. Away from work, Davis is an outdoor enthusiast, including mountain biking, road biking, running and golf. His wife, Lyle Hull Davis, is director of education at the Bodine School in Germantown, and they have two teenage girls who attend St. Mary’s and a son who goes to Presbyterian Day School. “Most of my life at this stage is spent around my kid’s extracurricular activities,” said Davis, who grew up in North Carolina and Philadelphia. He’s now looking forward to leading the growth of another local company. “It’s a great time to be stepping into this role, and hopefully it will turn into another success story for Memphis,” he said.